*Can be powered by inner rechargeable battery or DC 5V. *Also can be used as an alarm clock. 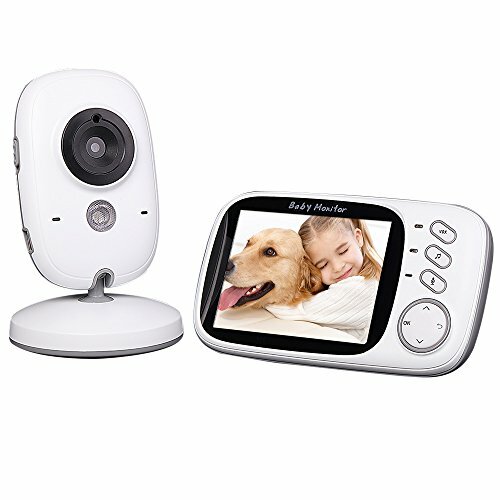 ✔ 3.2in 2.4GHz Wireless Baby Monitor + Camera support Auto Pair Plug and Play 2-way Talk IR Night View Temperature Music VOX Rechargeable Battery for Home Surveillance. ✔ Built-in MIC and speaker for two-way audio monitoring. ✔ Built-in 4 lullabies to help your baby to sleep soon. ✔ Real time temperature monitoring, constantly guard your baby's health. ✔ Built-in smart VOX mode, VOX sensitivity adjustable, low/medium/high level optional. More power-saving. Monitor screen will automatically wake up when sounds happen (like baby crying), and into standby when quiet, free from worry anymore.